The focus of the British press before, during and after last Sunday’s 33rd Virgin London Marathon was on local Olympic champion Mo Farah’s half-way-only test run for next year’s full distance debut. Even Tsegay Kebede’s final kilometer win over a faltering Emmanuel Mutai was couched in the context Farah ’s first half presence. 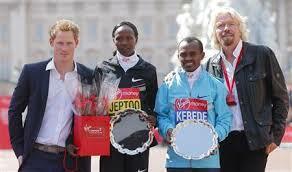 Was this what race officials hoped when they signed Farah after recruiting “the greatest marathon field in history”? Or was it simply an indication that today’s version of such a field is incapable of holding public attention on its own? Whichever, when a local show pony like Mo Farah who had no intention of completing the race dominates race news coverage, which he did, it’s a clear indication that running has a problem that fast times alone cannot solve. What London 2013 revealed was the continuing lack of connection between an audience and the current crop of the world’s top distance runners. And one wonders whether the sport either notices or cares. London, England — The second lead story from yesterday’s Virgin London Marathon — the first was Mo Farah’s half-way test run — was the collision between wheelchair record holder Josh Cassidy of Canada and 2012 Women’s Olympic Marathon gold medalist Tiki Gelana of Ethiopia at an aid station at 15K. Hardly the headline race organizers would have hoped to generate after they’d invited the best race fields in event history. But that’s the point, they did it to themselves with an asinine starting schedule which sent the 5:20 per mile women runners out 20-minutes before the 3:30 per mile wheelers. Do the math. London, England — On a glorious spring morning for racing Ethiopia’s Tsegay Kebede and Kenya’s Priscah Jeptoo took home the glory at today’s 33rd Virgin London Marathon. In winning their respective races in 2:06:04 and 2:20:15 against fields of staggering depth and quality, the two athletes from neighboring East African nations returned the focus of the sport to international goodwill and competition rather than the infamy and horror visited on the Boston Marathon this past Monday. But though the two pro fields were as good as they come, the two races could not have been much different. London,England – Of course, anything can happen, but on this final day before Sunday’s 33rd Virgin London Marathon the talk around the Tower Hotel hard along the rolling Thames River has turned to the what-ifs. What if the men go for the world record? Who will make the first break when the rabbits depart? What if Mo Farah, the double Olympic Brit track champ going along for the ride for the first half, does something beyond sit off the back and observe? What if the stacked field doesn’t go with the pacers and turns inward and tactical instead? Ah, racing, that most unpredictable of all dramas. London, England — VIPs from the running world gathered beneath the London Tower Bridge this evening aboard the luxury river yacht the Silver Sturgeon for a welcome celebration to the 33rd Virgin London Marathon. But though the professional fields for Sunday’s races are the best in the world this year, and perhaps the best in London’s illustrious history, not surprisingly the topic most under discussion remained the terror attack at Monday’s Boston Marathon. Race directors of America’s two largest marathons, Mary Wittenberg of New York City and Carey Pinkowski of Chicago, huddled together to consider what the industry as a whole might do in response rather than just what the six World Marathon Majors might put forward. Then first year London race director Hugh Brasher, son of event co-founder Chris Brasher, addressed the crowd welcoming them to the city, but also remembering the loss suffered in Boston. Hugh next introduced defending men’s champion and Olympic Marathon bronze medalist Wilson Kipsang of Kenya who spoke movingly in the name of his fellow athletes. 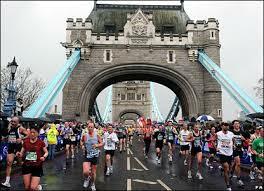 London, England – News here in the U.K. is just as Boston focused as everywhere else in the aftermath of Monday’s marathon bombings and today’s firefight and manhunt in Watertown, Mass., even as the Virgin London Marathon prepares for its own 33rd start this Sunday morning in Blackheath. But having staged an Olympic Games last year, and dealt with the IRA troubles for so many decades before that, London officials feel they have a good handle on security for the marathon. Notwithstanding, the police presence for Sunday’s London Marathon will increase by 40% from 2012, according to Scotland Yard. “It’s about making sure that the people who come to London on Sunday feel safe when they are in the city,” said Chief Superintendent Julia Pendry who has headed security at the London Marathon for the last five years. Where I first came to know and watch the Boston Marathon in 1976. Called it home for 23 years. Much life was contained therein.